Safety Grating also named diamond safety grating, anti slip grating, anti skid stair treads. 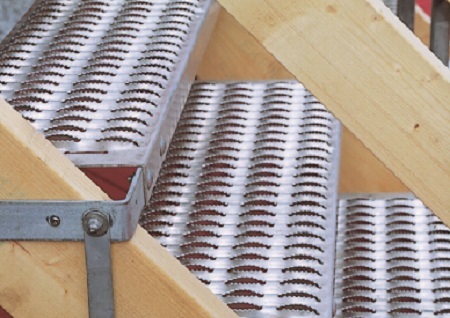 Safety gratings protect workers through its unique one piece steel or aluminum diamond-shaped construction which provides gripping friction to the sole of a shoe in all directions. The raised diamond-shaped spokes allow mud, ice, snow, grease, oil, chemicals and detergents to drain through the holes leaving the surface free of any slippery substances. The serrated edges not only provide traction but also include a cushioning effect which evenly distributes the weight of each footstep thus reducing worker fatigue. Looking for ideal The Stairs Perforated Safety Grating Manufacturer & supplier ? We have a wide selection at great prices to help you get creative. All the Punching Checkered Plate are quality guaranteed. We are China Origin Factory of Checkered Plate Sidewalk. If you have any question, please feel free to contact us.